Like all equipment, conveyor systems are investments and, in the face of shrinking capital budgets, it is important for companies to get an adequate financial return out of the investment. Regular maintenance can help ensure aging conveyor systems continue to be reliable and run smoothly. In addition, inspection and subsequent correction can ensure that minor problems do not snowball into serious issues requiring substantial downtime. Here are a few simple maintenance tips to keep your conveyors running smoothly. It is a foregone conclusion that mechanical parts will fail. The daily whirring and friction of production take their toll on mechanical parts. A failed part can cause serious downtime and continued production with a failing part can result in substantial damage to other parts of the system. Having spare parts at the ready can help reduce downtime and get you back up and running quickly. Contact us now to stock up and achieve peace of mind. Scheduled, regular inspections play a key role in keeping conveyors running efficiently. 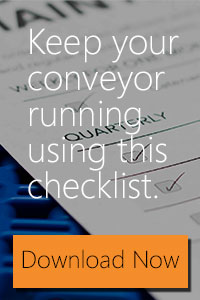 We’ve created a conveyor checklist to help you accomplish long lasting operation of your conveyor system. Download now. Chain bearings need lubrication to decrease friction. It is important to decelerate the wear between the pins and the bushing in the chain joints, eliminate debris and to ease the chain’s connection with the sprocket. When a chain lacks proper lubrication, wear from one joint to another can vary drastically resulting in erratic action. Rapid joint wear can cause early loss of timing in a conveyor. Employees who understand how to properly operate your conveyor system inside and out are your greatest resource in guaranteeing long-lasting conveyor life. Contact us for manuals or to inquire about training. Conveyor Maintenance Tips was posted to Words in Motion - A blog created by Product Handling Concepts, your source for conveyor, conveyor equipment, and automation solutions.